This Pink Topaz and Diamond Halo Ring in 14K White Gold gives a style that's been going strong since the Art Deco Period a bold new sensibility. With an attention-grabbing center gem with modern feminine flair, this is one dazzling ring that will never fade into the background. The star of this halo ring is a semiprecious gem that interprets the color of girlhood dreams in brilliant fashion, giving it a bright, daring look that's completely grown up and glamorous, but that never forgot how to have fun. 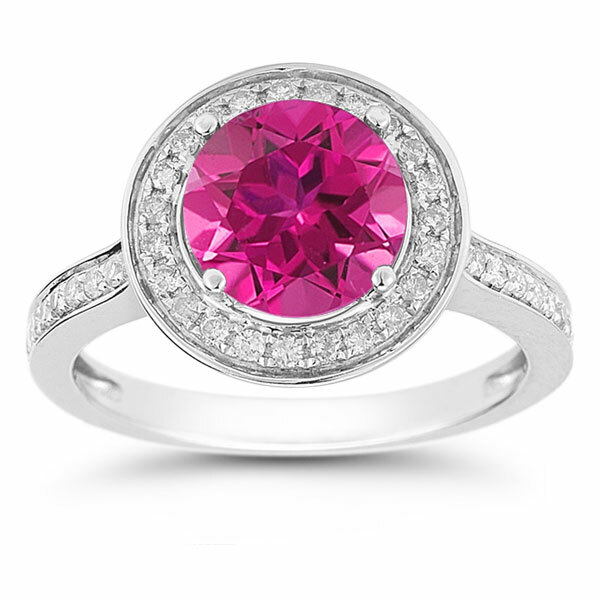 Its vivid pink glitter instantly catches the eye, giving this halo ring a decidedly outgoing personality. This 8m round pink topaz is accented with 0.43 carats of diamonds (43 small round stones in all) that stud the sleek, shining band and form a frame of glimmer around the center gem. 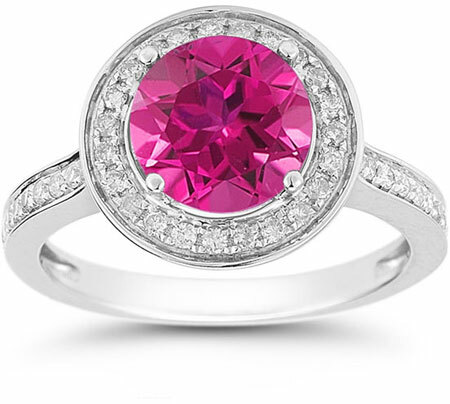 These diamonds provide a striking sense of contrast that makes this bright pink gem seem even more vibrant. A setting of 14K white gold provides a cool, understated backdrop for this bold halo ring. This updated take on a design from the 1920s is modern and glamorous, with a look that's sure to make a statement and stand out from the crowd. We guarantee our Pink Topaz and Diamond Halo Ring in 14K White Gold to be high quality, authentic jewelry, as described above.